In my last few clinics, I’ve seen several patients as second opinions for what each patient felt like was a failed meniscus surgery. Each of them was somewhere between four weeks and three months out from his or her surgery with another surgeon, and each felt as if he or she should be doing better at that point after surgery. I realized that there is a common misconception about how quickly someone should recover from surgery for a meniscus tear, so I would like to discuss expectations after meniscus surgery. 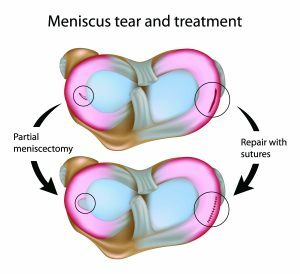 As I’ve said in another post about meniscus surgery, there are two basic procedures involved in surgery for a meniscus tear. One involves repairing the meniscus, or sewing it back together. The other, and usually far more common procedure, involves trimming the part of the meniscus that is torn out. Since trimming part of the meniscus out, or partial meniscectomy, is the far more common treatment due to the nature of most meniscus tears, I’m going to discuss the recovery and rehabilitation of this type of surgery. Here are tips for you to ensure a better outcome after surgery. Why does it take so long to recover from meniscus surgery? People often ask me why it takes so long to get over surgery that involves trimming out the part of the meniscus that is torn. It does seem plausible that if you take out the part of the structure that’s causing the pain, then recovery should be very quick. Unfortunately, while this logic would seem to make sense, it’s not quite that simple. You have to remember that while this is a very short procedure, often only 15 to 20 minutes, and only involves 2 to 3 very small incisions, it’s still a big operation. After surgery, the knee is swollen due to the fluid run through the knee for the surgeon to see through the scope. The swelling causes the knee to be stiff and the muscles to be weak after surgery. It takes time for each patient to get the swelling down, regain full range of motion, and restore full strength to the muscles around the knee. Not uncommonly, I hear patients claim that they know someone who had the surgery and was back to full activity with no problems in two or three weeks. Now while that might be true, you have to remember that not all of these surgeries are the same. There are often other findings that might impact the duration of the recovery. Most importantly, some patients have more damage to the articular cartilage (cartilage lining the ends of the bones), which can slow down the recovery and increase the amount of pain felt after surgery. I think it’s important not to focus on how other people do with this surgery, as it is often like comparing apples to oranges, and instead focus on what they can do to recover as quickly as possible. The first thing to emphasize is that I allow full weight bearing immediately after surgery. What I mean by full weight bearing is that weight bearing is allowed as tolerated. Just because a patient is allowed to put full weight on it, that doesn’t mean that it’s easy right away. It often takes patients several days before they’re walking with all their weight on it. It may be several days after that before they are walking comfortably. The knee is often very swollen, and I tell patients that the quicker they can get rid of that swelling with the use of ice and elevation, the faster the pain goes away. The faster and harder they can work to regain motion and strength, the quicker they’ll return to activities as well. I do think that working with a physical therapist can bring about a quicker return of full motion and strength, but I’ve seen patients do it through hard work on their own as well. I usually encourage patients to return to their athletic and exercise activities as soon as they feel comfortable. 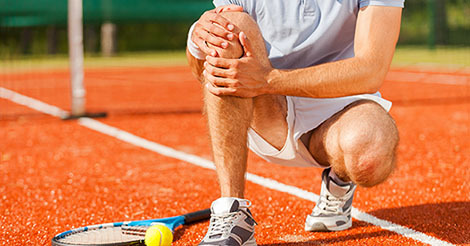 Usually the exercise and sports that they perform are not harmful to the knee, although they may not be easy at first. I have seen patients who tried to return to running fairly soon after the surgery complain that their knees swelled more initially. It’s possible that the repetitive impact on the knee may cause it to swell a little bit more than it would with nonimpact activities, so I’ll occasionally hold people out of running for 2 to 4 weeks. As patients begin to feel more comfortable doing high demand activities, I encourage them to get back into anything they like to do. In general, while most athletes and active patients are back doing the activities they want within 4 to 6 weeks, it may be 4 to 5 months before they feel as good as they are going to feel. It’s common to have days where the knee is more swollen or more uncomfortable, often for what seems like no reason at all. I usually recommend on these days to back off of activities and take it easy. Overall I think the process gradually gets easier and easier, and patients are doing most of the activities they want very quickly. If patients go in with realistic expectations that maximum improvement takes 4 to 5 months, although they might be doing the activities they like to do much earlier than that, they seem to be much happier with their outcomes. Understand your meniscus tear and your treatment options even if you have no medical knowledge and have looked everywhere for answers with no luck!